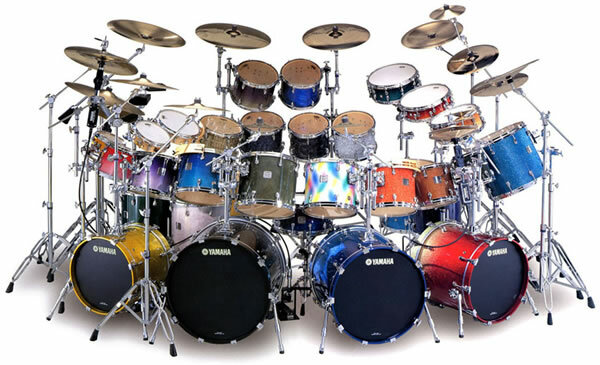 A drum set or drum kit, is the name of the setup of your hardware. This usually does not include your cymbals; however some people will include this into the description. A drum set can be any size, as well as any style. The most common drum sets out there are the 5 piece kits. These are set ups with a bass drum, snare drum, and 3 toms. Some small kits may only include the bass drum and snare, which are more common in jazz and other smaller band set ups. Here is an example of a large Drum kit. Drum Kits are the drummer’s tool. No matter what style of music you play, everyone has their own preference with set up. Make sure you experiment with every set up and design you can think of. You may be surprised to find you play better with a different drum kit setup. Save Your Money With These Drum Kit Buying Tips - It can be frustrating shopping around at different places, wondering whether the kit that you like is any good. I have bought and sold over 40 drum-kits in the last four years, and here are some of the things I've learned. Selecting The Right Drum Tip -Thats right, you have to make sure you get the right tip for your stick as well. With so many differnt shapes and sizes, you need to know which one works best for your style! To choose the stick, you must choose the tip! Understanding Drum Heads -In order to apply proper maintanace to your drum heads, you mus first understand them. How do they work? What makes them ring. This will let you in on everything you wanted to know about Drum Heads. Selecting The Best Drum Head - Drum heads are the most important part of your drum kit. You could have the nicest, most expensive drum set, but without decent skins, it would sound terrible. So how do we make sure our drums sound the best they can? Learn To Play Drums The Easy Way - Do you want to learn how to play the drums? Think it may be too difficult or require a lot of coordination? I've got great news for you! The truth of the matter is - if you can count to four, you can play the drums!